Autodesk has an internal communication called the Autodesk Point of View published by the corporate strategy team where we discuss the big ideas that are important to our customers and us. Each monthly issue helps employees understand company-wide strategy and keeps all employees rowing in the same direction. I am sharing an article from a recent issue because it provides a peek behind the curtain and shares how Autodesk operates as a company. 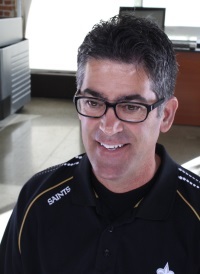 Jon Pittman is the Autodesk VP of Corporate Strategy. Jon has also been a Lecturer at the Haas School of Business of the University of California at Berkeley. One of the elements of our strategy is exploring what capabilities are needed by our customers to design places, things, and media in an everything-is-connected world. We're also investigating what the educational experience should be to prepare students to use such tools. As part of studying this first-hand, Jon has 170 connected devices at his home. That sounds like a job for Project Dasher. Jon contributed this article to our latest issue about company values. In our most recent Autodesk employee engagement survey, some employees said they were unsatisfied with their opportunities for advancement. The percentage of employees who felt this way is just under the norm for companies similar to Autodesk, but most other measures of employee engagement are way higher, both at the company and team level. For example, Autodesk's voluntary turnover rate over the last few quarters is around 8%. The industry average for voluntary turnover at tech companies is around 14%, so we are considerably lower than the norm. So just what is the story behind these two opposing datapoints? Looking beyond turnover to tenure, we find that our average tenure is 6.16 years, and the industry average for tech companies is far lower (for example, Facebook is 2.02 years, Google is 1.90 years, Apple is 1.85 years, Amazon is 1.84 years, and Microsoft is 1.81 years). Our low turnover and long tenure mean that it is harder to move "up" in the organizational hierarchy because people don't vacate those positions as often as they do in other companies. In any hierarchy, there are, by definition, fewer positions higher up in the hierarchy, thus the opportunity for upward advancement, ironically, decreases as one advances. This is exacerbated at Autodesk because we are intentionally bringing in outside senior-level talent with new skills to help us with our company transformation — for example, Carmel Galvin for HR and the recently-opened search for a Chief Digital Officer. Thus, for a variety of good reasons — lower than average turnover, longer than average tenure, and recruiting of high-level talent — Autodesk has structural impediments to upward advancement. So how do we address this? In last month's Autodesk Point of View, we discussed two aspects of culture: instrumental and purpose-driven. Instrumental culture is about mechanics (what and how), while purpose-driven culture is about why. Traditional thinking about career advancement is instrumental; focused on mechanisms like grade-level, place in the hierarchy, titles, and scope of responsibility. Those are all important, but some are particularly challenging for Autodesk due to the structural impediments to advancement that lower than average turnover and longer than average tenure present. So what do we do? I believe the answer lies with our purpose. To understand what role purpose can play, it might be helpful to think about why Autodesk has lower turnover and longer tenure than other tech companies. I believe it is because we have a purpose that is compelling to our employees. We don't offer significantly better pay, benefits, or working environment than our peer companies. There are some elements of our culture which are appealing to employees, but I believe the overwhelming reason people stay at Autodesk is our sense of purpose. We help our customers do things that actually do make a better world. Our customers shape the physical environment we all inhabit, the products we all use, and the entertainment we all enjoy. The impact that our customers have on the real world is far more tangible than digital companies such as Facebook, Google, or Salesforce. Furthermore, our users are our customers. We don't differentiate between the two; unlike other tech companies with business models that rely on packaging information about their users to sell to their customers in advertising. I've been at Autodesk for almost 22 years primarily because I believe in our purpose. I believe in the transformative power of design, and how it can make a better world, and I believe in the interconnectedness of many forms of design. There is no better place than Autodesk for someone with my beliefs. At Autodesk, we have both clarity of purpose and strong strategic alignment and direction. And it's this position that can help us focus on the impact and purpose of our work, and via this, we can address the "career advancement" issue. Purpose cannot substitute for things like salary and benefits, but it can help focus people on what is important to them. If we align our employees' personal purpose and values with our company purpose, that can help motivate in the absence of structural advancement. This means articulating and aligning purpose up and down the organization. It means aligning individual purpose with team purpose and team purpose with company purpose. This approach is not without risk. Purpose-driven people are relentless, and obstacles to pursuit of their purpose will result in frustration and cynicism. That is where the instrumental elements of culture come in. Clear decision-making, accountability, speed of decision-making, delegation — all of these instrumental cultural elements help lower barriers that get in the way of people achieving their purpose. We can help employees advance in scope by helping them realize their purpose. This might allow them to take on more responsibility and scope without traditional upward advancement. It might, in turn, create a way for employees to fulfill their own personal missions. A purpose-driven culture can help mitigate the structural impediments to career advancement, but this does not absolve us from also addressing some of the instrumental aspects of advancement. Job titles come to mind, as does getting clarity on roles in which senior leaders focus more on why and what, delegating the how to their teams. You advance people by promoting them — maybe not in the traditional, hierarchical sense but by aligning them with purpose and giving them an increased scope of responsibility and the clear ability to get stuff done. Ironically, one of the causes of lack of career mobility is a sense of purpose which keeps people at Autodesk. But if we continue to focus on building aspirational values — values that are both authentic and that embody a sense of purpose — then we have every chance of mitigating the historical lack of career mobility that comes with long tenure and low turnover. Thanks, Jon. As Navin Johnson (played by Steve Martin) said in The Jerk, "I have a special purpose." Advancement through scope and accomplishment are alive in the lab.